Weber carries a complete inventory of more than 100 blank label sizes and styles to meet a wide variety of thermal-transfer and direct-thermal labeling applications. Of course, like our variable-imprint labels, information can be printed on the labels using a number of label printing and/or application methods like Weber label printer-applicators or Zebra label printers. We stock a variety of general-purpose materials in addition to a number of specialty materials for specific applications. These labels are perfect for shipping labels, product identification labels, nutrition labels, warning labels and more. Take a look at our thermal-transfer and direct-thermal stock labels using the tabs below. If you don't see the size you need, simply email your requirements to us and we'll have the Weber account manager in your area help you find a solution. 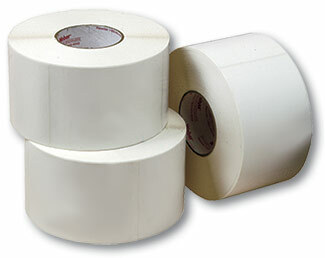 Weber thermal-transfer labels, in a wide variety of sizes, are now available at our ecommerce site - www.go-label.com! Just click the link for specifications and pricing. TT Perm stock labels combine a matte-coated, ultra-smooth paper facesheet with a permanent hot melt rubber-based adhesive. The material is reliable in lower temperatures and is ideal for applications such as automotive bar coding, inventory control and work-in-process. All rolls are 8.00" outer diameter on 3.00" I.D. cores unless otherwise denoted. Direct-thermal paper labels do not require a ribbon for printing. These labels are perfect for short-term applications and are made with a heat-sensitive facestock that creates images by the printer selectively heating the thermochromatic coated paper. Common sizes are shown below and custom sizes can be made to order.